So this is the thing: I’m sure you have a book in you. Perhaps more than one. That said, it may not be the one you think you need to write. I hope you will not be cross with me, but I say this because I’ve noticed something about folks who are working on book projects that seem to stall. A lot of folks tell me they want to write about war, peace, justice, a relative who did something heroic—and usually, I nod, thinking, I know, I know. I get it. Truly, I understand. I quit being a highly-paid lawyer when I was 26 years old to be an author. You better believe I wanted to have some respectability in my books. Consequently, in all my drafts, you could tell I was trying to garner praise, and my work suffered for it. After I failed for a long time, I decided that I would write to seek answers for my personal questions instead of writing to earn external validation. I finished two novels, written in a span of 22 years. I wrote numerous drafts, dumped a few, and started again. I wrote “on spec,” which you may know means that I did not have a contract for these books. I did not have agents for most of my writing life. No one asked for these books, and I knew for certain that no one was actually waiting for me to write them. Maybe you want to know why a human being would struggle so long to write novels. So here goes: I wanted to write about these topics. I wanted answers. I had questions. These books I wanted to read didn’t exist. I had the freedom of having already failed, so I figured I might as well write what I want. So, this is what I think you should do. Forget the book you think you need to write to get recognition, respectability, or praise. These things—if they happen at all—don’t come if you look for them. I want to encourage you to seek answers to your big, specific, personal questions in the form of fiction. If you want to write about finances, being brokenhearted, or simple loneliness—things you aren’t sure are important topics—let me give you permission to go ahead. Secondly, I want you to feel that your subject matter is far more interesting than a secret lover. If you’ve ever had a passionate love affair, then you know that for this person you adore, you’re willing to do some tough things. Well, pivot, and channel those feelings into your novel. Ask your forbidden, least respectable, perhaps illicit and shameful questions on the page, and answer them. For such questions, you will get up an hour earlier in the morning to write your two pages. Forget the shame, the wish for praise, because writing a book will not save you, publishing a book will not redeem you, and winning a prize will not give you the love you deserve. However, writing a book to find the answers to the questions of your heart will help you find the person you deserve—it will give you your true writer’s heart. I wish you peace and pages. Loved Min Jin’s pep talk? Let her know! 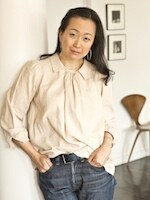 Min Jin Lee is the author of Pachinko, which was a finalist for the National Book Award. She has written for the New Yorker, and the New York Times, and has served as a columnist for The Chosun Ilbo, South Korea’s leading newspaper, for three seasons.